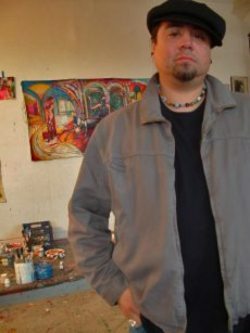 This is the first art exhibit by Jeff Abbey Maldonado since the tragic loss of his on, Jeff Jr., to a senseless act of gun violence last July. We celebrate his return and invite you to meet him at the opening event. There will be catered food and beverages. For this exhibit, Jeff states, " I began making art again in December, 2009. The effort gave me purpose and direction in a time when I needed it most. Everything reminds me of Jeff Jr. In our home life, we adopted a number of jests and routines which served to cement our bond through play and creativity. I recall these memories, words, and phrases which morphed into our private jokes, sometimes far from their original source. 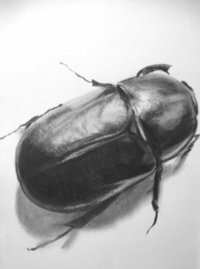 Graphite on paper is the most direct means of visual expression. It also requires a physical effort to achieve a proper surface. During that time, I listened to Jeff's music and it gave me the power to push on and begin creating again. Near the end of my paper supply, I was propelled into my own stratosphere, where thoughts were transformed several times into images with the faintest connection, and yet with high emotion. Over 20 drawings resulted in the effort. The last of these, "Body Shop", marked the return of my earlier themes and symbols--Cars and Women: The rebuilding of the spirit through the eternal life-giving power of the woman, and the symbolism of the classic American automobile. The automobile has symbolized our identity and status. I was painting a series of auto crashes, which represented our collective state as a country, up until the moment of our own loss. I felt I could never return to these works, as they belonged to another time. Yet, in the process, they have re-emerged and are re-interpreted into symbols of power and memory."